It doesn’t matter how much money you pour into national advertising campaigns, customers are still going to judge your brand by the quality of service they get at the nearest location. And you can be certain they’re going to make their opinions known. 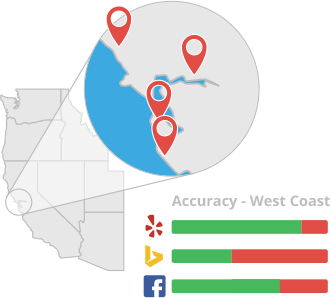 If you’re a business with multiple locations, you need an easy way to monitor all of your reputation data. Our is the best-in-class tool for multi-location reputation reporting. Compare scores between locations and identify the best and worst performers, enabling you to better focus your time and effort. 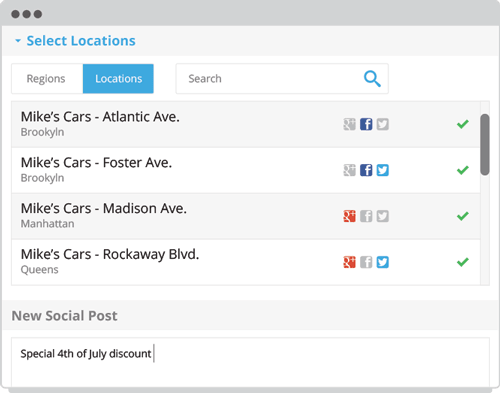 With multi-location posting, you can post to Facebook, Twitter and Google+ for numerous locations at the same time. See how and where your locations are listed on directories, review sites and social networks. Monthly reports give you a birdseye view of your online presence and allow you to dig deeper into individual locations. There is no limit on the amount of locations that can be added to reports.